This Mid-Autumn Festival sees Tai Thong not only introducing original themed flavors but also giving Malaysians a more meaningful family celebration with origami birds. In Asian culture, colourful folded paper birds which are showcased on all six collectible mooncake boxes have always been synonymous with good luck and blessings, making them a fitting festive accessory for this occasion. Tai Thong, long recognized for its innovative best-selling mooncakes continues to thrill Malaysian with -eight first-in-the-market flavors offering a distinct Japanese flair. The established mooncake manufacturer has instilled some of Japan’s ubiquitous ingredients such as matcha (powdered green tea), Fuji Apple, Tokachi red beans and even wasabi into their latest mooncake range. 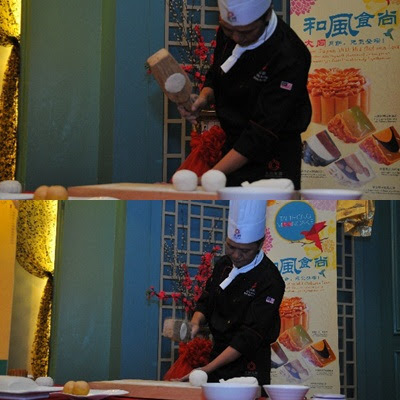 According to Tai Thong Group Executive Mooncake Chef Yiu Wing Keung, the creative ead behind the unique mooncake flavors , all new flavors are low in sugar in line with the Health Ministry’s effort to encourage Malaysians to reduce their sugar intake. 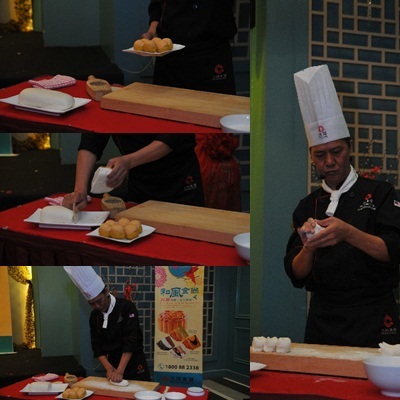 ‘’We kept the sugar content in our mooncakes to a minimum level without compromising on the delicious tastes and aroma,’’ says Chef Yiu. The 2-piece and 4-piece mooncake boxes each presents a pair of origami birds in four auspicious colors: red, denoting good fortune and joy ; green, the traditional color of health and harmony;yellow, meaning warmth and promise of a brand new day; and purple, denoting wealth and grace. 1) Low sugar Imperial Matcha Lotus with Tokachi Red Beans (RM16 each), featuring high grade green tea lotus paste dotted with naturally sweet Tokachi red beans form Japan. 2) Low Sugar Wasabi Lotus with Wakame Seaweed (RM 16 Each), Japan’s staple horseradish spice offering a pleasant tingling aftertaste mellowed down by nutrient-rich dried Wakame seaweed lotus paste. 3) Low sugar Fuji Apple & Violet Lotus with pumpkin Seeds (RM16 each), crunchy pumpkin seeds bringing out the full flavours of fragrant Japanese Fuji Aapple and unique violet flower extract lotus paste. 4) Low sugar Black Sesame White Lotus(RM 16 each) , roasted Japanese black sesame seed puree is blended with white lotus and given a savoury hint with salted yolk. 4) Low Sugar Chestnut Snow Skin White Lotus with Tokaichi Red Beans and Kuri Chestnut (RM16 each), chestnuts imparting subtly sweet nutty flavor to white lotus paste speckled with Tokachi red beans. I personally thinks that this is something extraordinary in the market, to create such 'unique' and authentic wasabi flavor without giving the spicy 'kick' that is so powerful (the green horseradish you usually have in Japanese restaurant). The taste is immediately discernible, as there is a subtle, yet sweet , pungent flavor... Not bad I would say, for those who loves wasabi, do not hesitate to give it a try! Genius, I must say. Who ever dare to imagine he/she can blend in an Fuji Apple flavor in a mooncake? Chef Yiu did it. The very light and refreshing , balmy aroma of fuji apple.. The first mouthful was sweet-scented, somewhat like flower hybridize with apple kind of sapidity. It taste less sweet compared to other mooncakes I've had before (I speak from experience). 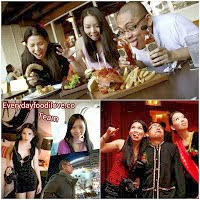 Three types of different flavor fillings, envelop with the chewy white snowskin. Surprisingly , the red bean, chestnuts and white lotus(bottom) are able to harmonize very welly together, one flavor did not simply aloft another; instead, the cross-over flavor between each other was rather united. Once again, I love the sweetness level . Just nicely adjusted, not too sweet nor under-sweetened. There were also unusual Japanese-themed fashion show entertainment. With petite and dainty ladies dressed in formal Japanese costume , parading with the newly launched mooncake flavors from Tai Thong. 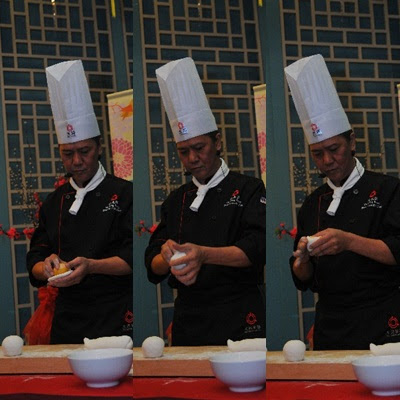 Into the mold the unshaped-mooncake go and chef displayed some of his'' kung fu'' by pressing and knocking the wooden gadget to remove the nicely 'printed' flowers at the outer surface of mooncake. Verdicts : To create a new flavor mooncake every year, the sky is the limit ; but to stand out from other competitors, creativity must be well formulate . Also, to attempt the 'creativity flavors' that can be accept by most of the consumers, the only way is to confirm every product has their very own unique characteristic and flavor, and when two or more elements are blended together, they create a very...let's say.. unique peculiarities. Due to popular demand, a classic Tai Thong snow skin mooncake flavor Snow Skin Lotus (RM14) returns this year, featuring lotus paste encased in snow skin pastry. For customers looking to give mooncakes to their business associates, clients or corporate partners, Tai Thong’s limited edition mooncake gift box (RM118 per box) is available as a stunning corporate gift. One box consists of six Tai Thong Mooncakes, namely Lotus Pasta Single Yolk, Jade Custard, Low Sugar Imperial Matcha Lotus with Tokaichi Red Beans,Low Sugar Wasabi Lotus with Wakame Seaweed, Low Sugar Fuji Apple & Violet Lotus with Pumpkin Seeds and Low Sugar Black Sesame White Lotus Single Yolk.